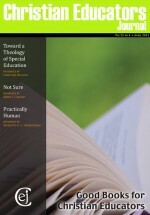 This issue of CEJ focuses on “Good Books that all Christian Educators Should Read.” I would like you, therefore, to submit recommendations of books in keeping with this theme, but also to consider the question of which books we might suggest that Christian teachers introduce to their students. One of my coffee mugs reads, “So many books . . . so little time.” That certainly reflects how I feel! I love to read, but as a busy teacher, I don’t have enough time to read everything I want to. I do find time to read professionally, though, and here are a couple of books that have given direction and purpose to my teaching this year. Affirmations 2.0: Christian Schooling for a Changing World by Steven Vryhof. This short book is a remake of an earlier edition, and includes foundational, educational, and communal affirmations that pertain to Christian schools. This is an important book to discuss with colleagues in Christian schools. The Art and Science of Teaching by Robert J. Marzano. This is a solid, practical book outlining classroom instructional strategies that shape effective instruction—something every teacher needs to be reminded of and encouraged to implement. Hmmm. . . . what book should Christian teachers encourage their students to read? There are so many wonderful children’s and young adult books—where do you begin? After considering several possibilities, I’ve got to go with C. S. Lewis’s classic, The Lion, the Witch, and the Wardrobe. This book has proven to be a rich and moving story that has captured the imagination of readers for decades. I’ve read it to third graders, taught it to fifth graders, watched my three children get absorbed in it as they grew, and observed my husband preparing to teach it to his college students. It encourages all of its readers (and listeners) to wonder about Narnia, Aslan, the deep magic and the deeper magic before the dawn of time. The fantasy and reality of the story blend wonderfully in the hearts and imaginations of its readers to produce a truly outstanding story for children and adults alike. This time around, instead of recommending any particular books (I confessed the last time we wrote on this topic, I only read boring histories), I would like instead to talk about the need to read widely. In this hyper-partisan age of narrow-casting we are increasingly permitted to seclude ourselves in the warm, comforting embrace of the thoughts, opinions, and sentiments with which we wholeheartedly agree. We need to do more than simply hear each other shouting across the divide. We need to listen to, be familiar with, and even find merit in the ideas of the other side. To that end, I have recommitted myself to the practice of reading widely across the spectrum. This is actually much harder than it sounds. Those who join me in this challenge will invariably find themselves yelling at their iPad in outrage. But possibly even more upsetting may be the discovery of truth and beauty resting comfortably within the “enemy’s” camp. Of course for me, it starts with histories. So I try to find authors telling the various stories from perspectives and interpretations that will not be my own. When I’m online catching up on the news, I will go to the Chicago Tribune, then to The New York Times, and on to the National Review online and The American Conservative. Recently, this habit of reading has yielded surprising insights with respect to the newest round of gun debates in the wake of the Newtown, Portland, and Aurora shootings. There are those who see gun nuts, and those who see nuts with guns, but until we can understand each other, we can’t begin to work together to solve the problem of violence within our communities. This habit of reading is important beyond politics. Read Christianity Today, Sojourners, First Things, and World. Read poetry. Find perspectives from Africa, Asia, and Latin American. Beyond reading, listen. Listen to as many genres and generations of music you can stand. You will surprise yourself with what catches your ear and gets you humming.